There are multiple benefits to taking time out to go for a walk, including boosting productivity and improving the health of your body and mind. We know it can be difficult for conference delegates to take time out in a day that is scheduled from start to finish, and so we have mapped out a 20 minute jaunt that will give you some headspace as well as a little exercise, and allow you to see some key, iconic sites of Bath. * One of Bath’s finest Georgian buildings, it was purpose built in 1771 for an 18th century form of entertainment: the assembly; ‘a stated and general meeting of the polite persons of both sexes for the sake of conversation, gallantry, news and play’. Guests would gather in the rooms in the evening for balls, concerts and other social functions. 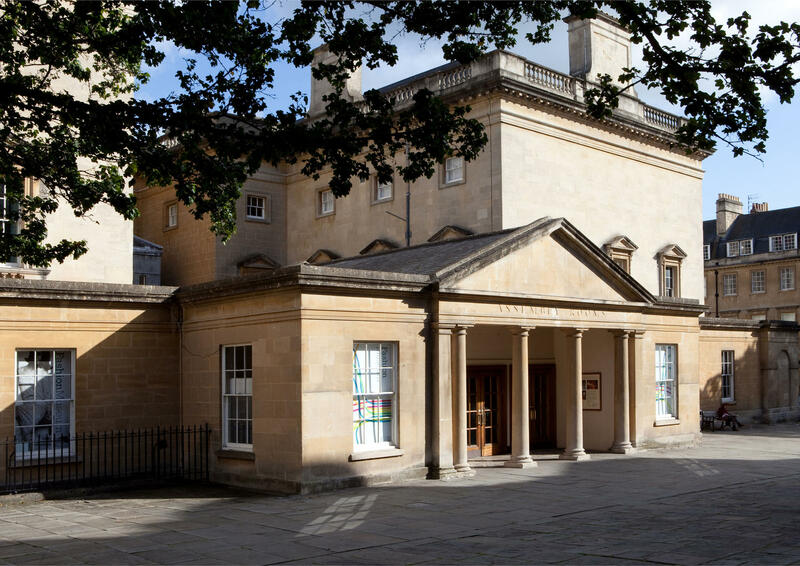 * Two of Jane Austen's novels which are set in Bath, Northanger Abbey and Persuasion, both mention the Assembly Rooms, which she called the “Upper Rooms”. * Adaptations of several historic novels have also been filmed in the Assembly Rooms, in addition to films such as The Duchess with Keira Knightly and Ralph Fiennes. * During the First World War the building was occupied by the Royal Flying Corps and subsequently the Ball Room became a cinema. * Charles Dickens gave public readings in the building. * Following extensive restoration the building was re-opened by the Duchess of Kent in 1938 but only four years later, was heavily bombed during the Baedecker raids and reduced to a roofless shell. * Following further programmes of restoration after the war, the American government, requested to buy the chandeliers, the finest set of 18th century chandeliers in the world, for the White House. This was never agreed by the National Trust or Bath City Council and the Whitefriars chandeliers remain in-situ. * Today the building is owned by the National Trust and managed by Bath and North East Somerset Council. It is an elegant and inspiring location for conferences, weddings, parties and dinners. For further information about holding an event with us, please complete our enquiry form or call 01225 477786. * Originally known as The King’s Circus, this street consists of three curved segments of Grade I listed townhouses, arranged in a circular shape. * John Wood the Elder, the architect for the scheme, died before construction of The Circus began in 1754 and his son, John Wood the Younger, completed the build in 1768. * The Circus was part of Wood’s grand vision to recreate a classical Palladian architectural landscape for the city and is considered his masterpiece. * Wood, convinced that Bath had been the principal centre of Druid activity in Britain, surveyed Stonehenge and used the same dimensions (318 feet) for The Circus' diameter. * The stonework consists of emblems, such as serpents, acorns, nautical and masonic symbols. It is thought that the acorns are tributes to the druids, creators of the stone circles that Wood admired so much. * The central area was paved with stone, covering a reservoir that supplied water to the houses. In 1800 the Circus’ residents enclosed the central part of the open space as a garden and it is now home to a group of plane trees. * The artist Thomas Gainsborough lived at number 17 between 1758 and 1774, using the house as his portrait studio. More recently, Hollywood actor Nicholas Cage has also lived at The Circus. 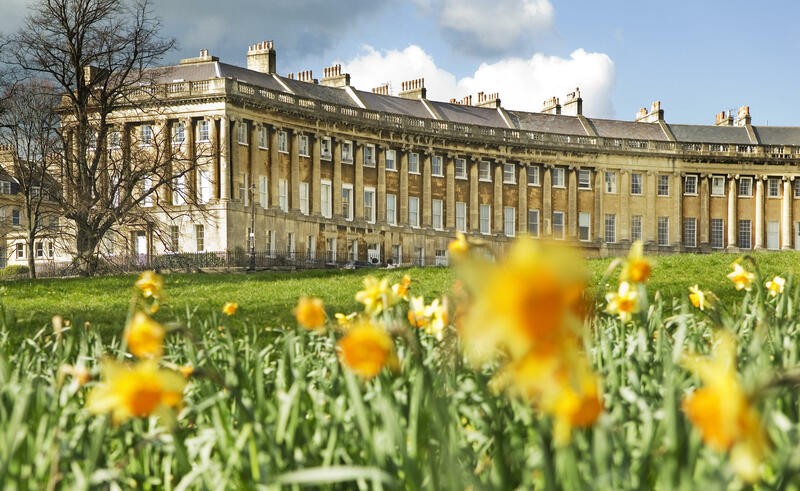 * The Royal Crescent was built between 1767 and 1775 and designed by John Wood the Younger. * Originally known simply as The Crescent, the street only gained its royal accolade at the end of the 18th century, following a visit from Prince Frederick, Duke of York and Albany. * Today, the crescent is home to a museum of Georgian life at no.1, a five-star luxury hotel and private housing. * The Crescent overlooks a ha-ha; a sunken stone wall, its top being level with the garden with a deep ditch on the far side: an effective barrier to livestock. This wall would be invisible from the houses ensuring a clear view across the lawn. 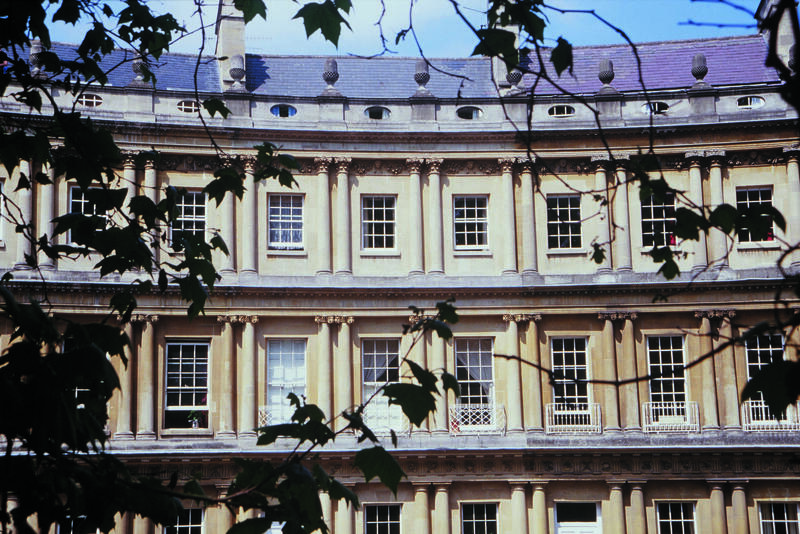 * Whilst the façade of the Royal Crescent is orderly, the rear is a mixture of varying designs due to each house being built by a different architect who, whilst obliged to follow John Wood the Younger’s specifications for the façade, were under no such constraints at the rear. * In April 1942, No. 2 and No. 7 Royal Crescent were both gutted by incendiary bombs, as part of the Baedeker Raids on Bath. These houses were subsequently restored to their former glory. * In 1972, the resident of No. 22, Miss Wellesley-Colley painted her front door and windows primrose yellow instead of the traditional white. She had to fight two enforcement orders from Bath City Council and defend herself at a public enquiry, before it was finally declared that the door could remain yellow. 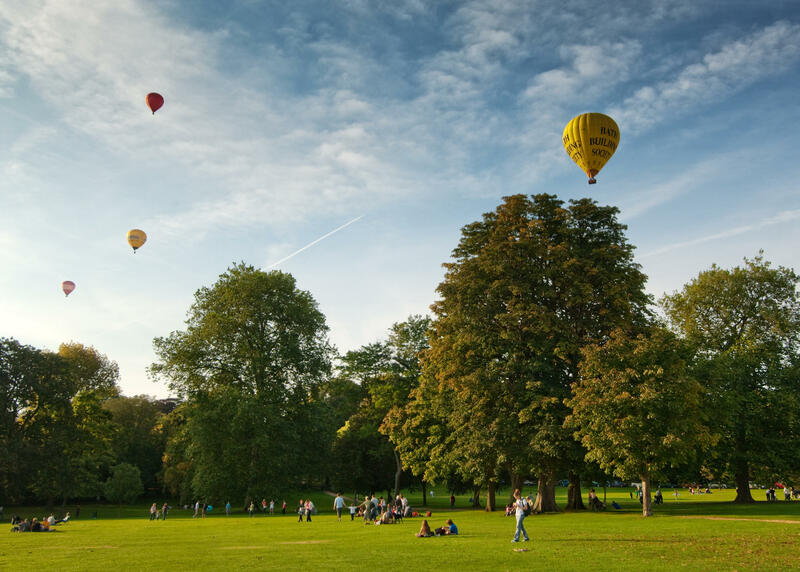 * Originally an arboretum, Royal Victoria Park spans 57 acres and is named after Queen Victoria, who officially opened it in 1830 at the age of 11. It was the first park to carry her name, and includes an obelisk dedicated to her. * The park contains attractions including a skateboard ramp, tennis, bowling green, putting green, a golf course, a children's play area and a 9-acre botanical garden. * The Botanical Gardens were formed in the north-west area of the park in 1887 and contains one of the finest collections of plants on limestone in the West country. * The Grade II-listed Botanical Gardens' Temple of Minerva was first commissioned and built by Alfred J. Taylor for display at the 1924 Wembley British Empire Exhibition. It was intended as an advert for the City of Bath, the healing quality of its Spa waters. In 1926 it was brought to Bath and reconstructed within the Botanical Gardens. * The park has received a Green Flag award, the national standard for parks and green spaces in England and Wales and is Grade I registered by English Heritage on the National Register of Historic Parks and Gardens.